"I like the idea of mining my data in thirty years or so, realising I spent most of my twenties at trendy coffee shops, airports, and places that don’t exist." Yes, this. This is the main reason I wrote Ghostcar – which is now one of my main reasons for using Foursquare. "Instead of using a dolphin model, we would, for example, use a colored rectangular solid or some tapered low-polygon basic shape. This plan would save us all a lot of headaches. Or it would have had I stuck to the plan. More on this later." This is a great post from Robert Hodgin about process, showing-everything, and how sometimes ambition leads to way more work, and is probably the right thing to do. Also: I'm still jealous of people who can think in 3D. That's part of my work for this year. I’ve been playing a little with Toca Boca‘s latest iOS toy: Toca Builders. As you’d expect from Toca Boca, it’s charming: a straightforward, paired down implementation of an idea, with unambiguous UI and lovely character design. 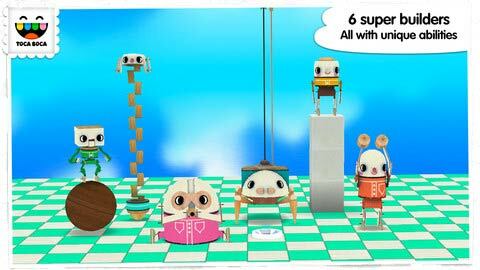 Builders is Toca’s take on a block construction toy for small children. Initially, it might seem a bit clunky, a Minecraft pastiche that’s not nearly so sophisticated as Mojang’s original. After all, it’s a tiny play area compared to Minecraft – six blocks of height and relatively small X-Y dimensions. It’s the plural in the title that makes it so interesting, though: builders. This is not (just) a game in which the user is a builder; it is a game about six individual builders (pictured above). Each has their own different ability: most can both construct and desturct; almost all can control the colour of blocks; some are better at changing blocks after the fact, others at sketching with. They each control slightly differently – and they each manifest in the landscape. You can swap between builders with a simple or menu, or by tapping on any that you can see. It’s the manifestation and personification of the four builders that suddenly clicked for me. As I played this, I realised what it really was: Minecraft through the eyes of Seymour Papert. Lego as LOGO. Even the simplest Turtle work can open new opportunities for sharpening one’s thinking about thinking: Programming the Turtle starts by making one reflect on how one does oneself what one would like the Turtle to do. Thus teaching the Turtle to act or to ‘think’ can lead one to reflect on one’s own actions and thinking. And as children move on, they program the computer to make more complex decisions and find themselves engaged in reflecting on more complex aspects of their own thinking. There are some lovely photos in Mindstorms of kids on a playing field, practicing Logo; one of them is being the Turtle, and the others are telling her what to do. The second you act out a program for yourself (or watch another child follow your instructions to the letter), you see how literal you need to be, or which line of code is ambiguous. You begin to see how the computer processes information (“thinks” being, unfortunately, an entirely inaccurate word). This kind of embodied representation of computational logic is very rare. Often, the hard things in computer science are very abstract. I do not know how to “pretend to be the compiler”; I just have to trust input and output. Toca Builders takes the abstract building of Minecraft – tools attached to a disembodied perspective (albeit one hindered by some degree of personhood – factors such as gravity, and so forth) – and embodies them to help younger children answer the question which tool would you use to place a block where you need to? Or sometimes backwards: which block shall we place next? It is not quite as freeform as Minecraft, but it actually forces the user to think a little harder about planning ahead, lining up his builders, and which builders go together well. Measure twice, cut once. To that end, it’s much more like real-world building. Papert was very clear about one particular point: the value of this is not to think in mechanical ways; it’s actually the opposite. By asking children to think in a mechanical way temporarily, they end up thinking about thinking more: they learn that there are many ways to approach a problem, and they can choose which way to think about things; which might be most appropriate. And so Toca Builders is, in many ways, like all good construction toys: it’s about more than just building. It’s about planning, marshalling, making use of a limited set of tools to achieve creative goals. And all the while, helping the user understand those tools by making them appear in the world, taking up space in it, colliding with one another, and needing moving. All so that you can answer the question when you’re stuck: well, if you were Blox the Hammer, what would you do? Some of what looks like clunkiness, then, is actually a subtle piece of design. If you’re interested in the value of using computers to teach – not using computers to teach about computers, but using computers to teach about the world, then Mindstorms is a must-read. It’s easy to dismiss LOGO for its simplicity, and to forget the various paradigms it bends and breaks (more so than many programming languages) – and it’s remarkable to see just how long ago Papert and his collaborators were touching on ideas that are still fresh and vital today. A great post on the detailed design of an iOS app; I particularly like the focus on animatics, and also on rearranging the screen rather than always swiping to a new one; it's a thing I've sketched before. This is super-good – not just on ARGs, which aren't necessarily flavour of the month, but on designing difficult puzzles for a large number of people to solve, and how not to be surprised by how fast groups are at solving things when they have the network. Gating the experience with slow tasks – MD5 brute-forcing, for instance, is one nice idea; I also really like Adam's points about making sure players know precisely what is in-universe and what isn't, so there's never a question of whether something is right or not; just like a good cryptic crossword. Hello Lamppost ends up on the Creative Review blog. "Analog a la carte is an experiment I (@urtubia, @bigrobotstudios) am conducting for rendering sequences on real synths remotely. This webfrontend will enqueue sequences into a job list that is read by a raspberry-pi at "headquarters". Once the raspi receives the job, it then both sends the sequence via midi to a synth and records it in realtime. Finally it encodes the resulting audio file into an mp3 file and uploads it to Amazon S3, so that this server is nice and ready for getting more sequence requests." "About 1 minute and 4 seconds after Gunpoint became available for pre-order on the evening of Monday the 27th of May, it had recouped its development costs. This was not entirely surprising, since the only direct development cost was buying Game Maker 8 for $30 three years ago. The surprising bit happened next." It is really lovely that Gunpoint has worked out so well for Tom. It's an interesting little game, and I'm glad he's going to keep poke "interesting" games rather than having to make a pile of money. Well done him. Oh, Brian. Funny and kind-of-right in equal measure. "Marky Markov is an experiment in Markov Chain generation implemented in Ruby. It can be used both from the command-line and as a library within your code." It's very fast, and basically does all the work I've been doing on my projects by hand for me. But better.